Since my last report Gold has continued its volatile range trading between $1,225 and $1,280. Although the bulls are still somehow in control there is no clear trend and you might do yourself a big favor if you just stay at the sidelines here. Bitcoin instead behaves more convenient and less volatile for now. Bitcoin seems to approach the apex of its multi-month triangle. A decision is close and a strong move likely to happen soon. 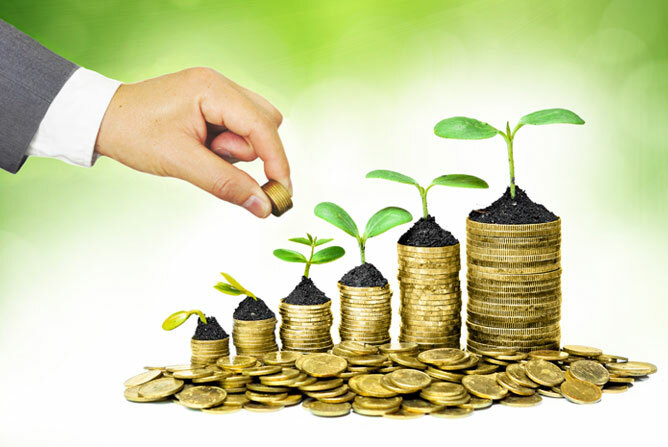 Another sector which is getting my attention is agriculture. Especially the grains are interesting and promising. I am issuing a buy recommendation here! Overall keep in mind that we are approaching a timeframe which is not very supportive seasonal wise. 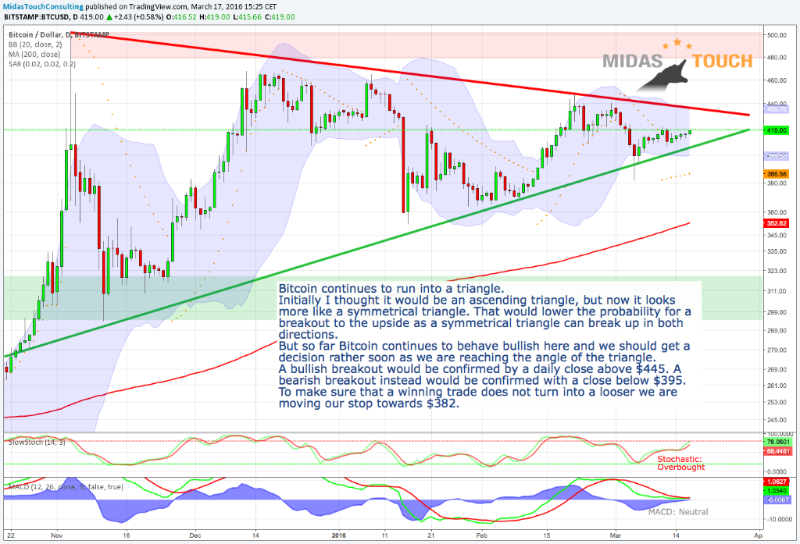 Bitcoin is approaching the apex of its triangle. A decision and therefore a big move is getting imminent. But since it now looks like a symmetrical triangle the breakout could happen to downside too. So far Bitcoin behaves bullish but to make sure that our winning trade does not turn into a looser we are moving the stop towards $382.00. Action to take: Hold your Bitcoins and let your winnings run. Don´t buy here. 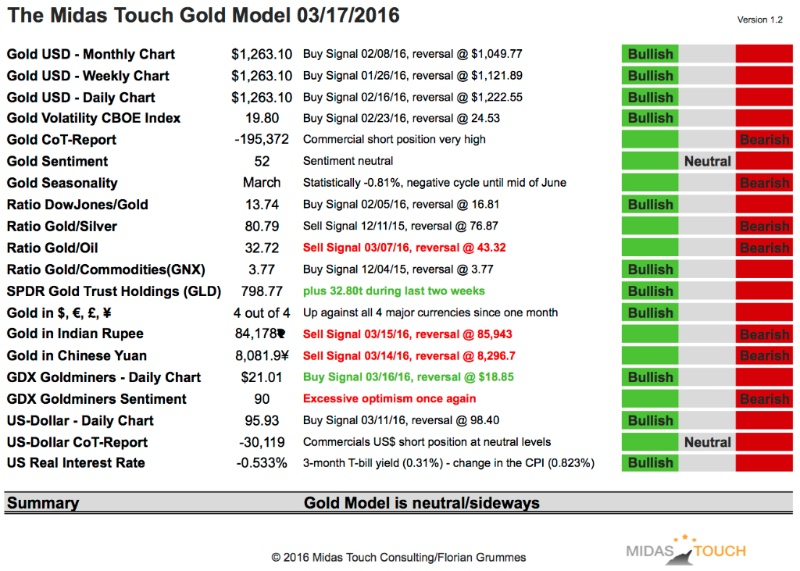 Overall the model has been moving between bull and neutral mode during the last five weeks. Most of the time it´s been bullish. From a trend following perspective Gold is still bullish in US-Dollar. But the negative seasonal outlook as well as the very high commercial net short position delivering strong bearish signals. The model´s conclusion is to stay at the sidelines. 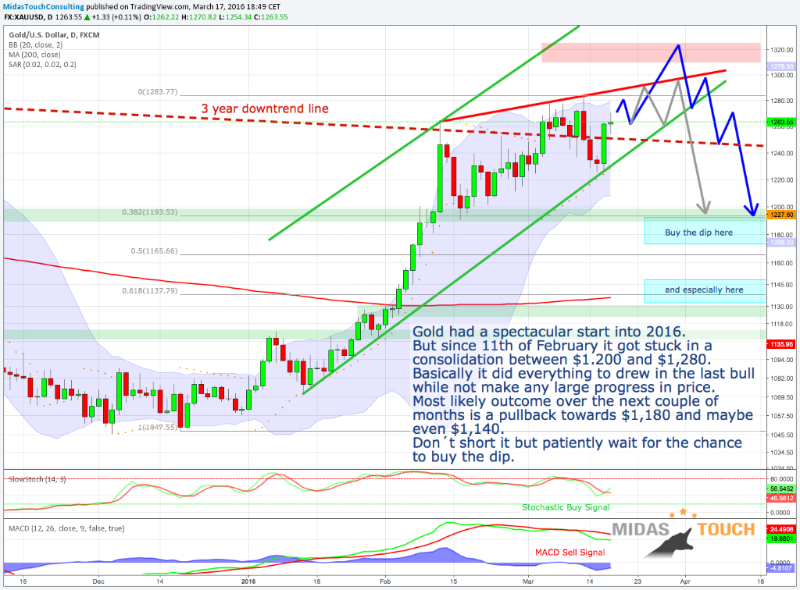 Gold had a spectacular start into 2016 but since 11th of February it is basically stuck in a volatile consolidation. After breaking out of a pennant on march 3rd it failed to push through the resistance zone between $1,270 and $1,280. After a marginal new high last Friday a larger pullback seemed to have finally started but with yesterday´s FOMC meeting the bulls are clearly back and have been able to push Gold towards $1,270 once again. Basically all that Gold did during the last five weeks was drawing in many new and speculative ETF buyers without making any significant progress in its price while the commercial hedgers have ramped up their shorts into this wild back and forth range trading. From a technical point of view this weeks pullback has been the first and successful test of the new uptrend line. If Gold indeed is running in this trend channel it should not fall below $1,232 anymore. On the upside the next target is $1,325. Note that Gold remains short-term overbought for quite some time already, but a young bull can stay overbought much longer too. More concerning are the negative divergences forming in the RSI and MACD. Also on a weekly basis Gold has not yet managed to sustainably break out of the three year downtrend channel which currently sits around $1,250. This makes $1,250 a pivot point and its no wonder that we can observe such a fierce battle here. It would not be a surprise seeing Gold rallying until $1,325 only to start a massive correction from there. But also a whipsaw consolidation over the next couple of months is quite possible. Another option would be a bearish rising wedge with another marginal new high followed by a severe sell off. Generally the most likely outcome will be a test of the 200MA until summer. That would mean a pullback towards $1,180 and maybe even $1,140. But so far there are really zero sell signals and if you have missed the train you simply have to be patient and wait for the chance to buy the next larger dip. I am pretty sure it will come until summer. Another important advise is not to short this market. A young bull will do everything to confuse and kill the bears. Action to take: Nothing. Stay at the sidelines but plan to buy with both hands once Gold is pulling back towards its 200MA ($1,136). Practice patience! Investors should buy with both hands if Gold moves below $1,150 again until you have at least 10% of your net-worth in physical Gold and Silver. If you are afraid of missing out something you can buy physical silver here, It´s cheap, hated and seems to have started a new uptrend. It´s not as strechted as Gold and the Gold/Silver-Ratio recently peaked at 84. 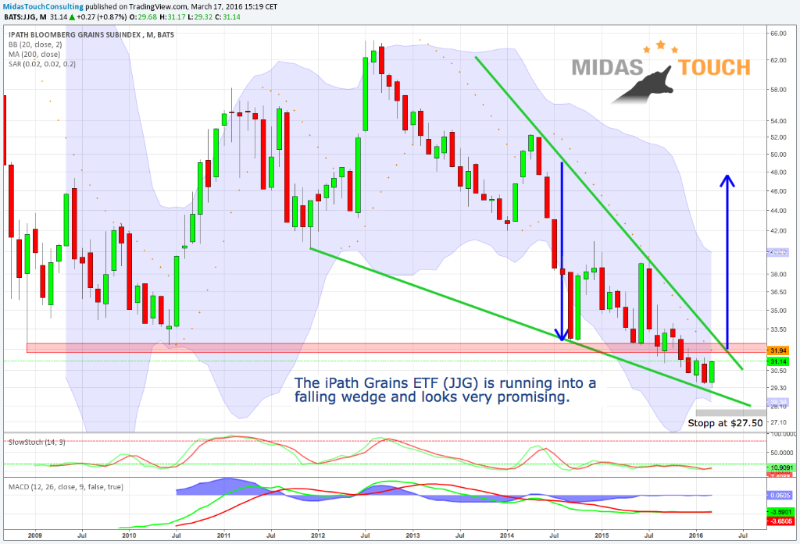 Since mid of 2012 grains are in a massive downtrend. The iPath Bloomberg Grains Subindex ETF has lost nearly 55%. But since three weeks we are witnessing some signs of life with a first recovery. The ETF is looking very promising here. RSI and Stochastic have not confirmed the recent lows anymore. Sentiment and CoT are very supportive while seasonality is sending mixed signals for Soybeans, Corn and Wheat over the next 6 months. Optimism has been exceptionally low with record bets against markets like wheat. Short-term the ETF is in an uptrend and has an embedded Stochastic on the daily chart. Therefore the uptrend is locked in and likely to continue. We bought Bitcoin at $372. New stopp at $380. Profit target $800. Plan to hold for a couple of months. Buy JJG (iPath Bloomberg Grain Total Return Fund) below $30.50. Place a stopp at $27.50 and plan to hold it for at least 3 months. 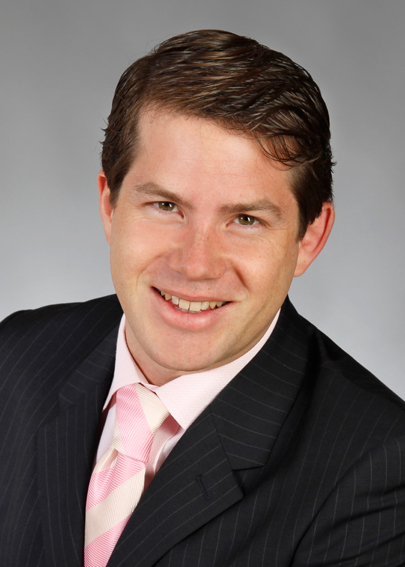 Buy Gold at $1.140 with a stopp at $1.100. Mostly likely we will have to wait until spring/early summer for this trade to become possible. Officially Gold is still in a bear market but the big picture has massively improved and the lows are very likely in. If Gold can take out $1,307 we finally have a new series of higher highs. If this bear is over a new bull-market should push Gold towards $1,500 and Silver towards $25.00 within 1-3 years.